You’ve heard that peanut butter is one of the healthiest foods for humans. That may be true of our species, but it’s not necessarily true of your dog. Some dogs can eat peanut butter and walk away unharmed. But others develop incredible painful yeast infections just from eating peanut butter. The ingredients in peanut butter cause this problem. Almost all peanut butters contain both natural and artificial sugars, which set the stage for yeast breeding. Trust us—peanut butter isn’t worth the risk! If your pet already has a yeast infection, we have some good news. Our product, Skin-Eze, is the perfect remedy for your dog’s itching. It contains topical herbs for direct application to your dog’s skin that will relieve itching and help your dog calm down. We also sell treatment packs and capsules. Every dog is different. Some dogs like sprays, while other dogs prefer to receive capsules in treats. Just make sure that you don’t hide them in peanut butter! It’s hard not to share our food with our beloved pets. But dog owners should treat peanut butter as a toxic substance. It causes your dog real harm and discomfort! Just like chocolate, there’s a chance nothing will happen, but there’s also a chance your animal will get sick. Instead of feeding your dog peanut butter and potentially causing a yeast infection, buy them manufactured dog treats instead. If you have to feed them human food, fruits, vegetables, and meats are the best choices. 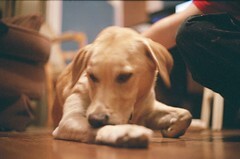 If you need to give your pup medicine, you can hide it inside a marshmallow or ground beef, which should satisfy them. And remember, if you pet does get a yeast infection, take the all-natural, holistic approach to healing them with AllergicPet.com’s products. Common dog skin allergies and ways to treat them. Like allergies in humans, dog skin allergies can develop at any point in a dog’s life. Dogs can develop allergies to pollen, medicine, mold, dust, bug bites, or even certain fibers like wool or nylon. With this long list, it might seem impossible to determine what’s causing your pooch to itch so badly. However, you can isolate variables and narrow down the possibilities. Watch and see when the itching or rashes get worse. For example, if your dog’s allergic symptoms get worse every time she goes outside, she may have a skin allergy to grass or another outdoor allergen. Likewise, if your dog goes into the damp basement and begins scratching like crazy, she might be allergic to mold. Whatever the cause, it’s critical to get your dog diagnosed as soon as possible. Your dog’s discomfort can vary greatly depending on the exact nature of the allergy. In more serious cases, dogs will begin to lose hair and develop sores and infections. You should act early to prevent this awful situation. Take your dog to the vet! Veterinarians can match your dog’s symptoms to different allergies. The vet will prescribe treatment for your pet, and it’s critical that you follow that treatment. Remember, your dog can’t treat herself—she relies on you to take care of her! In addition to the prescription from the vet, you may want to consider a holistic treatment. AllergicPet.com offers a wide variety of natural treatments for all kinds of pet ailments, including skin irritation. Our Skin-eze formula comes in both a pill and topical form. You can use it to soothe and relieve the symptoms of dog skin allergies. You can use it either in addition to your prescription medication, or by itself—but we highly recommend that you visit your vet. Dog skin allergies may seem small, but they could be an indication of a larger problem. You need the expertise of a veterinarian to get the full picture on your dog’s health. Now that summer has rolled around and your dog will be outside more than ever, the possibility for dog skin allergies is high. If your pooch shows signs of allergies, invest in a holistic remedy today! Some pet owners are not able to recognize the symptoms associated with seasonal pet allergies. One of the symptoms of seasonal allergies is itching. As the weather changes, does the environment. During the spring and summer months, allergies are at their worse. Pets are not only itchy, their skin is inflamed and irritated, and they develop a skin condition called allergic dermatitis. When the itching becomes unbearable, dogs may chew and bite on certain areas of their body. They may also rub their body on hard surfaces, including furniture and carpets. They do all of these excessive body movements, in an effort to relieve the itching. The more the pets scratch the more tender the areas on their bodies become, and the more miserable they are. If the allergies are too bad, dogs may experience hair loss, open sores and scabs. Allergies that are not attended too properly, may lead to skin infections. It is not usual for dogs to have problems with their ears, if the allergy is severe enough. Some dogs may experience sneezing and coughing, along with a runny nose and watery eyes. Seasonal allergies may be contributed to grass, pollen, ragweed, mold and plants. Dogs also develop bronchitis and sinus problems. Redness on certain areas of the body is also a clear indication of allergies such as red puffy eyes, and a red mouth. The more dogs and other pets are exposed to the environment, the worse their symptoms become. When the seasons change, so do the way dogs interact with their environment. Allergic reactions are often created by the dog’s immune system. Doctors usually prescribe one or more treatments for dogs, with mild or even severe allergies. Of all the medications doctors prescribe, many pet owners prefer using Skin–EZE as one of the treatment options. Some medications may include gels and creams. Other forms of treatment may include Benadryl shots and breathing treatments. The type of treatments dogs receive may depend on the severity of their allergies. Histamines and Omega 3 fatty acids can be added to the dog’s diet to help decrease or reduce inflammation. Why is your dog scratching so often? It may not be his desire to wake you in the middle of the night, but rather dog allergies. Many dogs are susceptible to them and most owners have no idea their dog may be suffering. There are hundreds of possible types of dog allergies, just as there are for humans. However, you may be able to pinpoint the problem from one of the most likely causes. By learning the cause, you may get the treatment your pet needs. What’s Causing Them? The following are some of the most common causes of pet allergies. If your pet is experiencing these, they could have itchy skin, rashes or even more severe reactions depending on their level of sensitivity. Could it be their food? Many dogs have food-related allergies, though this is not a true type of allergy. Rather, the pet just may be sensitive to some types, especially types of proteins or grains. Wheat gluten is a common cause of itchy skin. Mold may be an issue. For some pets, exposure to mold is a problem. This happens in any high-humid spaces where the air does not seem to dry out. Be sure to sanitize the dog’s surroundings and keep it mold-free. Are seasonal allergies possible?If you suffer from seasonal allergies, you may be wondering if you pet does as well. It is the most common cause of sneezing, in fact. A scratch test done by a vet may be the best way to find out. Other potential causes of allergies include the cat (yes, dogs can be allergic to cats) and insects. Some fabric fillers, shampoos and medications can also be the cause. The good news is by learning about these, you can learn how to keep your pet safe from them through avoidance. Just like people, dogs can have allergic reactions to a wide variety of things in their world. Many dogs suffer from seasonal allergies, where things like pollen and grass can affect them. Other dogs are allergic to certain insects and might even be allergic to their food. The most common dog allergy symptom is itching, and a dog who suffers from allergies will often have skin that becomes red and irritated. If your pet is exceptionally furry, you might want to check if your pal seems to be biting or chewing their leg. They could be suffering from allergies and you might not notice because of their fur. Your veterinarian may have several suggestions to help your dog with their allergy problems, but it is important to recognize that sometimes a natural treatment is the best way to go both for you and for your pet. Steroids that are commonly used to treat pet allergies such as prednisone can have serious long-term impacts on your pet. In addition, you will want to use a product for your dog that is safe and healthy for everyone else in your family as well. Some topical allergy sprays contain chemicals that are dangerous for infants and children. If you find that your dog seems to be suffering from skin allergies, it is important to act sooner rather than later. If the itching gets out of control, your dog can break the skin and it can open them up to a risk for infection. It is best to start with a natural dog allergy treatment. There are chewable natural treats that you can give your dog that will help with the itching, and they will think they are receiving a reward for doing something good. It’s a win-win situation for everyone. There are also herbal supplements you can create yourself. For instance, if you dip a cotton ball in witch hazel, you can gently rub it on your dog’s skin. It will provide them with instant relief, and you won’t have to worry about any harmful side effects. The most important thing to do is prevent your dog from itching, and then treat the allergy so that your favorite family pet is comfortable once again. Allergies are a common problem affecting over half of the human population at a variety of levels from mild (runny noses and itchy eyes) to severe (requiring emergency room visits). In spite of this fact we often fail to realize that our dogs are subject to the same types of allergic reactions as humans. The most difficult dog allergies to diagnose are food related. Food related allergies can sometimes be dangerous if left untreated. Symptoms of food allergies may appear as something different such as flea bites or other environmental sensitivities. However, certain foods may also cause itchy irritated skin, congestion and breathing problems, as well as digestive problems. For example, if your dog continues to have skin problems after using topical treatments and skin soothing shampoos, diet may be the culprit. Other symptoms of food allergies are dog diarrhea, gas and bloating and vomiting. And just like humans, dogs may also have severe life threatening reactions such as respiratory distress or more rarely anaphylactic shock. The only way to diagnose a food allergy in a dog is to eliminate all possible allergens from the dog’s diet. The most common food allergies are wheat, soy, eggs, chicken, beef, and dairy products. Anyone with food allergies will express the difficulties of grocery shopping. Many products are contaminated with allergens, and even the smallest amount may trigger a reaction. The same goes for dogs. According to WebMD, placing the dog on a hydrolyzed protein diet is the safest way to start the process of elimination. Once the dog has been on the special diet for 12 weeks, slowly introduce new foods and monitor your pet for any signs of distress. Once you determine the allergen, your veterinarian will discuss diet options with you. Often, pet owners must prepare home-cooked meals for dogs with allergies. In addition, new lines of allergen free dog food products are appearing on the market. Most importantly, consult your veterinarian prior to making any decisions that may affect the health of your dog. Your dog will thank you with many wet doggy kisses. Dogs, just like people, can suffer from allergies. Allergies occur when the dog’s immune system starts to react to everyday substances as if they are a danger to the animal. This can lead to scratching, scabby skin, hair loss, runny eyes, runny noses and sneezing. If your dog is suffering from allergies, his life is quite miserable. The good news is there are things you can do to ease his suffering, even without a trip to the vet. In fact, natural treatments that you can do at home are often the best way to tackle a dog’s allergies. Dust is a common trigger. If you suspect this is a problem for your dog, start by cleaning your dog’s bedding once a week and vacuuming your home twice a week. Vacuum any materials, including the curtains and couches, that could gather dust. If you suspect food as the problem, switch your dog to a specialized diet, or consider cooking food yourself for a while. If the fillers in the dog food are the source, the problem should clear up in a few days. Bathing your dog regularly can help remove environmental allergens from his coat. However, you will want to avoid cheap shampoos that may have allergens and perfumes in them. Talk to your vet about an allergen-free shampoo you can use. If your dog’s skin is irritated, cover it with a mixture of oatmeal and water. Leave it on his skin for 10 minutes, then rinse it off. This can soothe irritated skin. You can also treat hot spots with a mixture of equal parts water, baby oil and Listerine. Finally, consider investing in air filtration for your home. This can help remove airborne allergens, like mold spores and dust, so your dog can live in your home free from allergies. Remember, whenever possible, treat your dog’s allergies naturally. This will help avoid adding more allergens to his system as you work to control these uncomfortable symptoms. Food reactions – certain foods will cause some dogs to break out in hives and skin irritations. It’s not common but some dogs due have reactions to what they are eating. Protein reactions and wheat gluten are both known to trigger reactions. Mold – When dog food is stored in large quantities, it can develop mold, especially if some type of moisture is present. Most dog food ships dry, but that doesn’t mean it can develop spores quickly when the conditions are right. Ingesting mold can trigger skin reactions in some dogs by causing an immune system drop. Other animals – Dogs can react to other dogs hair and dander just humans in terms of allergies. People – Believe it or not, your dog can be allergic to human beings too. In terms of topical treatment, pet owners have a bit of a challenge because dogs are covered with fur. This makes it a bit hard to apply a topical treatment effectively. However, a good bath cleaning with a pet shampoo and an application of tea tree oil can alleviate itching from a topical perspective, at least providing temporary relief. Other topical treatments aren’t so much applied to the dog’s skin as it applies to the surroundings. Using air filters cut down on animal dander and fur flying around. Frequent vacuuming of the indoor areas where the pet frequents does the same. Air conditioning cuts down moisture which removes mold potential where the food is stored. All combined and applied regularly can help reduce allergy sources for a pet. All of the above are natural approaches to treating a pet without resorting to drugs or chemicals. This provides a healthier remedy for the pet as well as less chances of side effects. Regardless of the type of allergy your dog has, it may lead to scratching. Scratching causes its own host of problems, including skin infections and hot spots. Skin infections can manifest in several different ways, and often get worse if left untreated. Skin infections may be cause by fungal growth, bacterial growth and inflammation from itching. Allergies cause itching, which in turn may cause inflammation, which causes more itching – the result is open sores where more bacteria and fungi will grow. Depending on the type of skin infection your dog has, it may require anti-parasitic agents, anti-fungicides or antibiotics to keep it from spreading and to clear it up. You can also try to treat your dog with herbal remedies. Check the warm, moist environments on your dog – its mouth, lips and groin – for signs of skin infection. You should also check toes, elbows, belly and your dog’s tail for signs of infection, as they are pressure points that bruise or rupture easily and allow the introduction of infection below the skin’s surface. The infection may look similar to the inflammation caused by a flea infestation and allergies. Superficial skin infections – infections on the “outer” skin often show up as redness, inflammation, small bumps and some hair loss – should be treated before they migrate to “deep skin” infections. These deeper skin infections present with foul odor, puss and lumps that look bloody on top of the skin. Diagnosis and treatment is nothing to fool with, but you must determine the underlying cause of the skin infection. If your dog has allergies, once the skin infection has been treated, it will come back with a vengeance if the underlying cause has not been treated. Allergies can cause a vicious circle: They can cause skin infections, which you clear up, but because the allergies have not been contained, the skin infection reappears, usually worse. You can treat your dog with an herbal remedy such as Skin-eze, but be sure to see your veterinarian about the proper medication required to eradicate the skin infection. You will have to treat your dog’s allergies for its life if you want to try to avoid skin infections. If your dog seems to constantly get infections, be sure to use a shampoo created for allergy dogs, and dry it off completely after a bath or swimming. The moisture can contribute to the growth of bacteria on your dog’s skin. Dogs can develop allergies, just like humans can. Symptoms can be similar as well. However, you do not want to treat your pet’s allergies the same way that you treat yours. Over the counter allergy medicines can be very dangerous and even deadly to your dog. Here are the top 5 at-home remedies that can work for your dog. Oatmeal – Add one cup of oatmeal to a tub of warm water. Pour water over your dog’s coat, rubbing in circular motion to work the oatmeal water down to their skin. Allow to sit for 10 minutes and rinse your dog with warm water. Apple cider vinegar- Simply put the apple cider vinegar in a spray bottle, gently pull back the fur and spray directly onto the irritated skin. Avoid pollen – The best relief is avoiding it as much as possible. However, they will be exposed to some pollen outdoors. When your dog comes in from outside, wipe their face and paws with a damp cloth to wipe off any pollen on their fur. Avoid dust – It can irritate allergies in dogs. Vacuuming often and emptying the bag frequently can help, as well as using a dust cloth on surfaces where dust can gather. A good HEPA air filter system can help remove dust also. Change out food – If a food allergy is suspected, try a different brand. Making your dog’s food at home is an option many pet owners are turning to recently to ensure what their dogs are eating. Finding the solution that works for your dog may take some time, but identifying the cause and treatment that works for your pet can bring them relief from the irritating symptoms of allergies.